All of my picks this year are from my favorite website uncommongoods. They have the best gifts for everyone on your list. This website is my go to when looking for a unique gift. Here are my picks for that special someone in your life. You seriously cannot go wrong with any of these gifts. 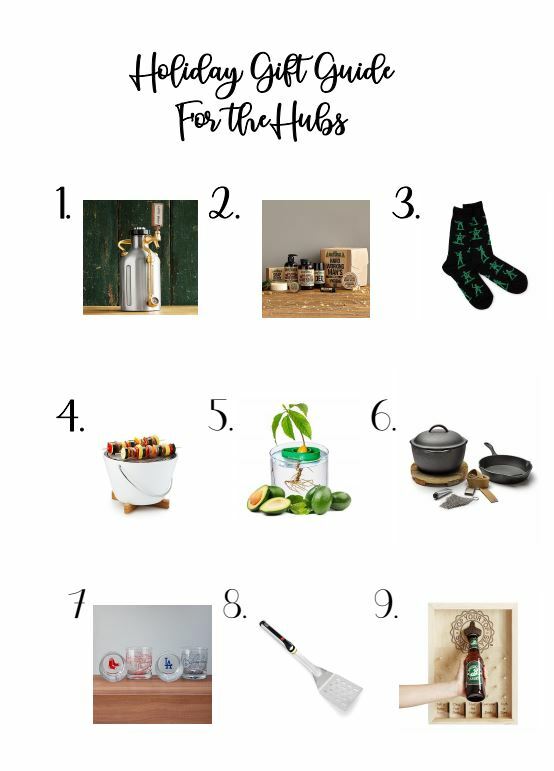 I hope you enjoy this Holiday Gift Guide For The Hubs. 1. Pressurized Craft Beer Growler–This is an awesome gift for the beer lover. You can have this filled at any brewery. You can have fresh beer on draft in your fridge year round. This portable tap system is bound to make any beer lover one happy camper. 2. Hard working Man’s Hygiene Kit-All ingredients are all natural. Comes with a scrub, soap, salve, deodorant, hand lotion, foot salve, and lip balm. Geared toward the working man. Great gift for any hard working husband. 4. Tabletop Portable Grill– This is a perfect gift for the man who loves to BBQ. Take this portable grill with you wherever you go. Great for the beach, park or a picnic. Small, compact and easy to clean. 5. Avocado Tree Starter Kit– Great gift for any man who likes to garden. Who doesn’t love Avocados. Great little kit for any Avocado lover. Its the gift that keeps on giving. 6. Cast Iron Cooking Set- This is a great gift for the man in your life that loves to cook. A cast iron pan is a gift that will last forever. Non stick and easy to clean. Its a 2 piece set, you wont disappoint with this gift. 7. Baseball Park Map Glasses– Great gift idea for the sports lover. These glasses are so cool and any baseball fan would love this set of 2 whisky glasses. Pick your favorite stadium and get to enjoying some whiskey in these unique glasses. 8. Grillight Spatula– This is a great gift for the BBQ lover in your life. This comes in handy when needing to grill outside in the dark. If you BBQ a lot this is a must have. Has an LED light in the handle and super easy to use. 9. Bottle Opener Slot Game– I thought this gift was super fun. I have seen a lot of bottle openers but not one that is this different. Unique gift for the beer lover in your life. Lots of fun every time you pop open a bottle. 10. A Romantic Night (no link needed)- Plan something special for your husband this Christmas. My hubs is the type of guy who would rather go out and do something fun instead of exchange gifts. Plan a special night away sans kids and light a fire, pop open some wine and enjoy. We all know that is what they really want anyways.